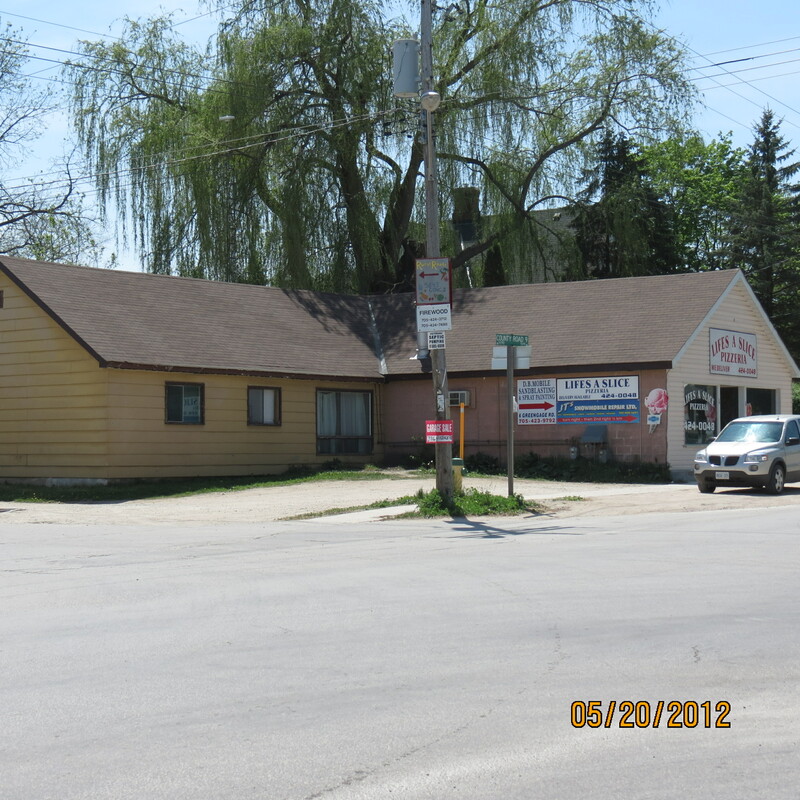 This is the former General Store where I worked with my Dad, George Duff. It was also the Post Office. After I came home from Yorkton and my bride to be, I helped my Dad who ran the New Lowell General Store. Dad and I became partners in the business. My share of the partnership was paid by building the cold storage locker-room and cold-storage boxes used to keep frozen goods. At that time, you see, very few people, well, no one, had freezers. They just weren’t available. So they had to do something different. They rented my locker boxes from the Duff store. (Jack Lockhart and I built them). We had to keep a list of these locker boxes because we only built so many and the boxes were quite popular. The cold storage room itself was a large room that housed two conventional freezers. I had gone down to Oakville with one of Don Duff’s trucks to pick up the freezing units. The boxes were made out of wood and lined with insulation came from Portugal in sheets. We had to cut the sheets to fit the box. The cork came from cork trees. Everyone had their own lock and key for their box and the cold storage too. The lock was needed to cut down on the vandalism. People stole each others’ food on occassion. We also butchered and wrapped quarters of beef. Not only did we well the meat, we also sold the hides. We made $10.00 per hide – there must have been worth about a dollar per pound. The hides, we took to Barrie to Hayden’s. My Dad, George Duff was also the Post Master for New Lowell and operated the post office out of the General Store. His job was to sell stamps and send parcels. He quite a stamp collection as he had been saving the stamps from the letter I sent him from overseas. Business at that time was good. I was still patiently, well sort of patiently, waiting for Paula to graduate. Duff’s Transport was my Grandpa Don’s business. I wasn’t in the world yet to see that but I do remember his garage and all the school buses that he had later on. That garage burnt down one night. I wonder if you have any photos, Donna, of the old garage? Found your blog while looking into the history of New Lowell. I am putting together a family tree, with a biography of my mother’s life as a surprise for her and to share with our large family on her upcoming 90th birthday. She grew up in New Lowell and is the daughter of Jack Lockhart. I would like to share this story, with your permission of course. Oh,my goodness – boy that name sounds so familiar! I’ll bet she will know the name Bill and Paula Duff – even George Duff (my grandfather – after whom the Legion is named). Of course you may share this story! Thanks for the note – anxious to hear her reaction and happy birthday to your Mom! Okay – so I totally forgot about this story and had to re-read it! I wrote it – on my Dad’s behalf. He passed away June 27, 2012. Today would have been his 96th birthday – nice that someone remembered him today! Thank you for letting me share your Dad’s story. My Mom might remember the Duff family as New Lowell was a very small town in those days, and as she approaches 90 she still has a pretty sharp memory. She might even remember her Dad helping to build those cold storage boxes. Maybe at times she was sent to fetch the meat for dinner. My Grandpa Jack Lockhart, a carpenter by trade, helped build many barns in the area, including the one which is depicted on the bags of Miss Vickie’s chips. The house he built for his family on County Rd 9 at the corner of Lamers Road is still there. My parents were married at New Lowell United Church, lived in Toronto and then Hamilton. I have fond memories of visiting New Lowell as a child. My Aunt Irene and Uncle Glen Mumberson ran the grocery store back in the 60’s. I have traced my ancestors to the Sunnidale area dating back to the mid 1850’s when they emigrated from Scotland. It is wonderful that you have put your father’s stories on record. A lasting tribute to him which some day his descendants may find down the line, and they will come to know his life and times in his own words. His memory will always be alive. Oh, Kim – I recognize so many of those names and in particular Mumberson’s store. I think my Dad wrote about being there in his WWII journal – will have to peek again – still have yet to go through those stories. I do wish your Mom a very happy birthday and mention to her that I am also connected to Jack McArthy (spelling?). He is still alive and vital too!!! So nice to hear from you – and yes, I’m so happy to have had the good fortune to write his stories!